John Hamilton, athlete. administrator and international team manager, died on 5th July, 2014. I only knew John slightly, having first spoken to him in 1975, but he was for many years one of the top officials in the sport and well-known throughout Scottish athletics. This short profile should start with the obituary notice written by his friend Ron Morrison for the Scottish Athletics website. “John Hamilton started running in the Edinburgh Rover Scouts and is recorded as having won a National U17 team silver medal when he finished 8th in 1952. When the Rover Scouts morphed into Braidburn AC John followed them and ran in the Edinburgh to Glasgow Relay, a race he loved dearly, for the first time in 1954. However it is as an official and administrator that John has proved to be an outstanding servant of Scottish Athletics at both Club and National level. John joined the Club for which he is known, Teviotdale Harriers, when he moved to Hawick for work purposes in 1957. He served as President and Treasurer on numerous occasions. From 1964 he represented Teviotdale Harriers on the East District Cross Country Committee and took over as chairman in from 1963 to 1967. These duties entailed serving on the Scottish Cross Country General Committee where he became President for the 1969-70 season. After his Presidential year John served as Honorary Assistant Secretary from 1972-9. Not content with all that John took over as the International team manager in 1979 for the rest of the years that Scotland ran as a separate team in the World Championships. While John’s first love may have been Cross Country he was also an enthusiastic follower of Track & Field Athletics. He represented the club on the Scottish Borders A.A.A. where he was President on several occasions. After serving many years on the S.A.A.A. General Committee he was elected as President in 1981. 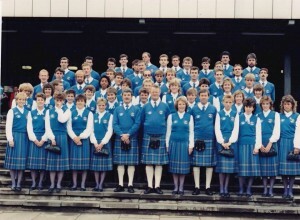 Furthermore at the 1986 Commonwealth Games in Edinburgh John was the Assistant Team Manager for the Scottish Team. 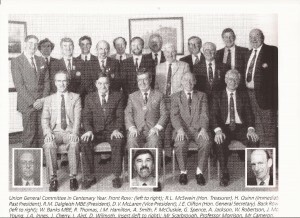 John was an Honorary Life Member of SAL and in 1988 was awarded the prestigious Tom Stillie Award by the S.A.A.A. for his contribution to the sport. Ron refers to John’s running career as a member of Edinburgh Rovers and Scouts and we can have a brief look at it here. His first championship appearance with them seems to have been in the East District Championships in 1952 where he finished fifth in the Youths (Under 17) race for the winning team. Then in the National Championships he finished eighth in the Youths race. One of the members of the senior team from the same club was Neil Donnachie who would go on to be not only a fellow member of Braidburn AC but a prominent official at national level in his own right. As was noted above the team was second, behind Cambuslang but ahead of a Bellahouston Harriers team for whom the scoring runners included R Penman 9th, F Nelson 10th, J Connolly 15 and R Nelson 23 with J Irvine being a non counting runner. Not a bad team to beat. 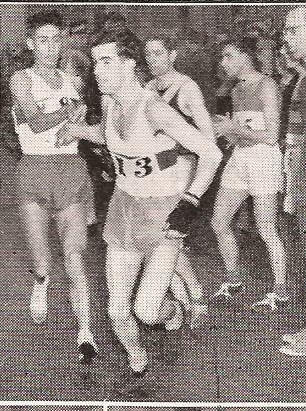 He seemed to miss most of the championships in 1952-53 but in 1954 he turned out in his first Edinburgh to Glasgow relay – an event in which he was to appear thirteen times in the 1950’s and early 60’s. This first run, in November 1954 was on the fourth stage and he maintained the club’s seventeenth place with a solid run that decreased the gap on those ahead. In the East District Championships that year he finished 38th in the team that finished fourth and in the National he was 39th in the Junior championship. On to the 1955-56 season and he was a member of the Braidburn team that finished second in the East District Relay, having run on the second stage, and followed this with a good run on the third stage of the Edinburgh to Glasgow where he picked up from 18th to 16th with the eighth fastest time on the stage . In the District Championships, John was 30th but was not out in the National event later that year. His third Edinburgh to Glasgow in November 1956 saw him run on the fifth stage again where he held tenth place for the team. He was 29th in the District Championships at the start of 1957 and 43rd in the National. In the 1958 Edinburgh to Glasgow he was back on the third leg where he maintained seventeenth position. In the National Championships, John, having moved to Hawick, appeared for the first time in the colours of Teviotdale Harriers, the club with which most of us associate him, and finished sixty first – second counter for his new club. In the Edinburgh to Glasgow of 1958 he ran on the fearsome sixth stage for Teviotdale and maintained the eighteenth position that he inherited. Twelve months later, in 1959, the Teviotdale squad won the medals for the most meritorious unplaced performance in the race and John ran that time on the fifth stage for the team that was sixth: he ran seventh time on his stage. Earlier that winter, 1959-60, he was in the Teviotdale team that was third in the East District championships: other team runners were B Mather, RK Hartley and J Jack. He was also in the team that was second in the East District championships at Hawick that year finishing 13th to be third counter. The club was tenth in the 1960 National with John second man home in 44th. The picture above came from Alex Jackson. 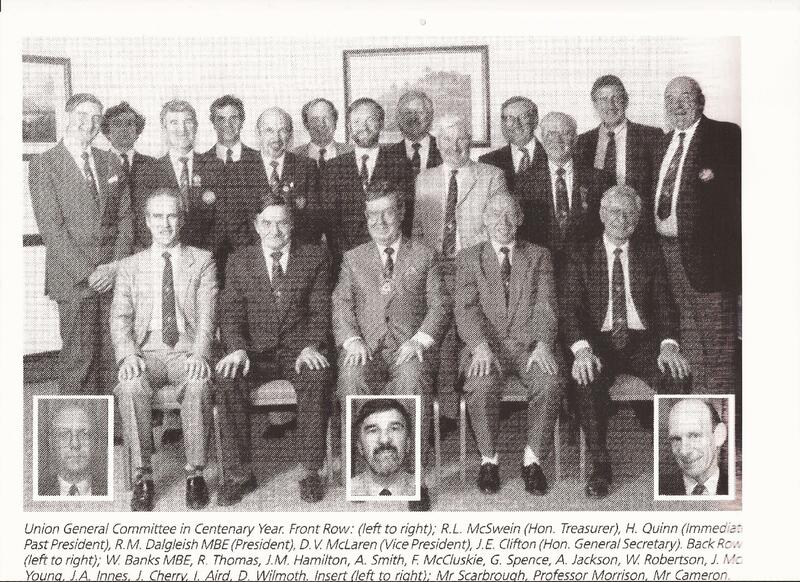 Alex spoke at the Teviotdale Harriers 125th Anniversary Dinner earlier this year and there were four of the team that won the medals in 1959 present: Brian Mather (2nd stage), George Meikle (4th stage), John Hamilton (5th stage), Jim Jack (6th). They were introduced and received a great round of applause from the gathering. In the 1960 Edinburgh he ran the third stage: taking over in twelfth from George Meikle he picked up to eleventh before handing the baton to Peter Roden and ran the fifth fastest stage time of the day. It was more silver at the District championships when he was a counting runner for the Teviotdale team that was second. In the National in 1961 he was 64th and the team was eleventh – one place behind Braidburn! Braidburn was also one place ahead of then in seventh in the East relays in season 1961 with John on the third stage. He picked up a place for the Edinburgh to Glasgow team which finished sixth and in the National that year he was 95th. The E-G relay in 1962 was another good one for John who picked up two places – from seventh to fifth – with third fastest time of the day, possibly his best ever run in the event. He wasn’t making the top four for the short relays but was a real asset in every race. In 1964 he ran the last stage where he ran in a ‘vacuum’ and held on to seventh position. In the Districts that season he was forty second and a member of the second placed Teviotdale team. Not in the counting six in the National, he was appearing in fewer championships by this time . He was nevertheless out in the Edinburgh to Glasgow the next year and ran eight, maintaining eleventh place. In the National, he was still running in the top 100, finishing 93rd. He did miss the next Edinburgh to Glasgow though and the one after that but was recalled to duty in 1968 when he held his position on then eighth stage. That was his last run in the Edinburgh to Glasgow where he had run thirteen times and on stages 3, 4, 5, 6, 7 and 8. He only ever dropped one place in any of them. He had won gold, silver and bronze team medals at District level and in general had had a good record in the sport. I have spent some time on his career as a runner because it was where he started and had a great deal to do with his career in administration and as an official from 1964. You can’t fool runners – if you have run in all the major cross-country and road events, if you have run in the wee local meetings, it shows in your approach to any of the many problems, large and small, that crop up at meetings, whether on the country, the road or on the track. In John’s case, it showed to the international squad where he took over as team manager in 1979, only ten years after he had been a serious competitor. Like all members of SAAA committees he started as a member of his club committee. He had joined Teviotdale Harriers after moving to Hawick in 1956, was elected on to the committee and went on to be Treasurer and President (from 1970). He was the club representative on the East District Committee and was Chairman of that body from 1963 to 1967. The next step up was as President of the Scottish Cross-Country Union in 1969-70 and was the first man from the Scottish Borders to hold that office. When he became Scottish team manager in 1979, the club centenary history tells us it was a role that would take him to Switzerland, Ireland, Italy, Poland, Norway, United States, Holland, Spain, France, Belgium, Greece, Hungary, Portugal and Israel. When talking to cross-country runners about the team managers they have scarcely disguised contempt for some, amused indulgence for others and for some, genuine affection and respect. John was without question in the latter category. It may have been his friendly manner, it may have been his common-sense approach but I think it must have had a lot to do with his own background as a runner. One of the many internationalists said that “Such an unfailingly cheerful, pleasant positive man. For me he was a familiar face to josh with before, or after, races and an ever-pleasant helper for decades. He had a great memory for names too.” Athletes need positivity from someone who knows the sport before a race, and John exuded that with a calmness which was also very necessary. He was SCCU rep on the SAAA General Committee from 1970 and was active in track and field athletics, and represented his club on the Scottish Borders AAA Executive Committee. Although from a distance running background, he was not only a Grade 1 Track Judge, but was also Grade 1 for Throws and Jumps. President of the SAAA in 1981, he was a British selector by 1986. John was also of course in action at the 1970 and 1986 Commonwealth Games. In the former he was a recorder for the marathon and walks and in the latter, as well as being Assistant Team Manager, he was secretary of the Athletic Technical Committee. 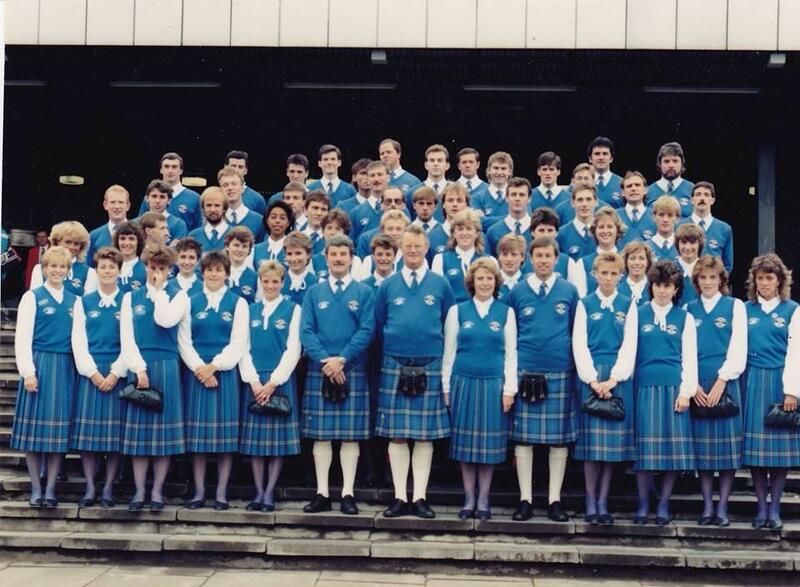 When the SAAA became the Scottish Athletics Federation, John continued to serve the sport and is listed in the 1995-96 Handbook as Grade 1 Track Judge, Grade 1 Field Judge and Marksman (or Starter’s Assistant) and noted as available to work as Press Liaison Officer. “Modest, well-mannered, good humoured with a sharp mind” said Ron – John was all of those and an athletes’ man first and foremost.